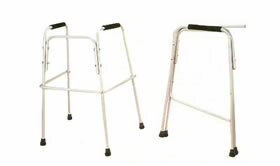 We have widest range of Walkers / Rollators suitable for adults, children and infants. Light weight, comfortable and mostly oven baked finished. 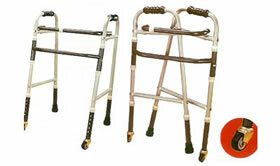 All our models are efficient and display quality in Walking Aids. Tubular steel frame mounted on 100 m.m. size ball bearing rubber castors. Height of under arm supports are adjustable from 105 c.m. to 135 c.m. Comes with detachable foam padded seat and rexine made back, for rest. Oven baked finish. For age group of 2 to 6 years. Tubular welded rectangular shaped ring fitted with adjustable saddle gear to hold the child in an upright position. Height of the ring is adjustable from 46 to 66cm. A handle is provided at the front for the patient to hold. Overall width of the frame 50cm and length 53cm mounted on four 50mm size ball bearing rubber castors. Powder coated finish. Aids elementary crawling when body support is required. Rexene made body hammock tilts forward or backward for correct positioning of the patient. Height is adjustable to accommodate children from 2 to 6 years of age. Powder coated frame beautifully finished. Tubular steel construction. 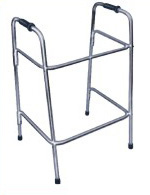 Chrome plated balance ring and handle bars are adjustable in height. Entrances from rear through hinged balance rings, height of frame is 70 cm, height of balance ring adjustable from 80 cm to 100 cm or as desired. Fitted with a bent pipe below to separate legs for scissors gait. Mounted on four 75 mm size ball bearing rubber castors. Oven baked finish. Light weight foldable walker, constructed of powder coated finished steel tubing with Two 10cm front wheels and Two safety PVC tips on rear legs. Each handle bar is individually adjustable for an exact fit. 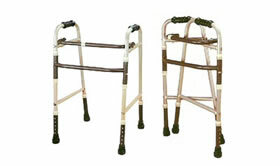 Patient pushes the handle bars to walk, front wheels eliminate side motion. Suitable for children Adjusts from 50cm to 65cm. Light weight foldable walker, constructed of powder coated finished steel tubing with Two 10cm front wheels and Two safety PVC tips on rear legs. Each handle bar is individually adjustable for an exact fit. 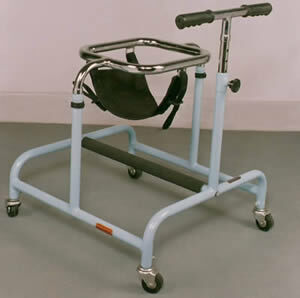 Patient pushes the handle bars to walk, front wheels eliminate side motion. Suitable for short adults. Adjusts from 65cm to 80cm). Light weight foldable walker, constructed of powder coated finished steel tubing with Two 10cm front wheels and Two safety PVC tips on rear legs. Each handle bar is individually adjustable for an exact fit. 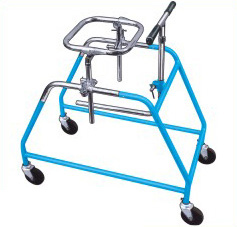 Patient pushes the handle bars to walk, front wheels eliminate side motion. Suitable for tall adults. Handles adjusts from 75cm to 100cm. Strong tubular construction. 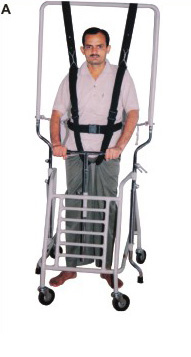 This walking aid provides complete balance support to a paraplegia patient and is fitted with shock absorbers. Comes with following replaceable and adjustable accessories to suit various patient. [a] Pelvic harness with a belt and fastner to hold the patient firmly. [b] Replaceable under arm crutches. [c] Replaceable handle in front to hold with both hand. [d] Replaceable can type handles. [e] Replaceable forearm rest with hand grip. [f] Replaceable seat for rest. Light weight anodized, polished aluminium tubular construction. 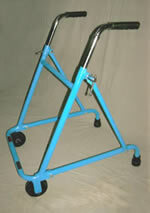 The fixed frame walker is fitted with soft hand grips and mounted on P.V.C. broad based tips. Standard fixed height is 90 c.m. Light weight, aluminum tubular construction with powder coated finish. Single button release allows walker to be folded for storage on M.S.pipe hinge. Height. : Frame is adjustable from 81cm to 91cm by slipping spring locking pins in proper notch. Inside Measurements. : Width 45cm. X Depth 28cm. Grips. : Fitted with soft PVC hand grips. Shoes/Tips. : Four, broad based PVC shoes. Approx. Measurements in folded position : 81cm x 50cm x 14cm. App. Weight: 2.5kg. 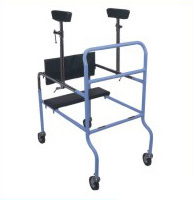 This heavy-duty walker with a welded steel frame & baked epoxy enamel finish is designed to withstand long-term institutional usage by a variety of patients.The wide base fits through standard doors and allow for greater leg room while gait training. Walker is fitted with height adjustable arm-rest pads with hand grips that provide full support for body weight. to be moved forward one side at a time, in step with the user.It also folds for easy transportation & storage. * Frame. : Sturdy 25mm diameter anodized aluminum construction. * Height. : Frame is adjustable from 76cm to 94cm by slipping spring locking pins in proper notch. * Grips. : Fitted with soft PVC hand grips. * Shoes/Tips. : Four, broad based PVC shoes. Aluminum frame, Light weight foldable Rollator with padded seat, wire basket & detachable padded backrest tube. Each handle bar is individually adjustable for an exact fit. Patient pushes the handle bars to walk. Suitable for tall adults. *Frame : Sturdy 25mm diameter aluminum tube construction with powder coated finish. *Wheels: Four, 6" x 1" wheels. *Brake : Loop brake is ideal for slow down and permanent stop.